This past weekend I was fortunate enough to attend Bloggy Boot Camp in Philadelphia, PA. It was a long drive for a short weekend, but the monotony was broken up by riding with Fadra from Raleigh, NC to Philly. There is so much to say about the weekend, but today I am giving you the closing shot of our weekend. On our way out of town we stopped by Pat's and enjoyed an amazing cheesesteak. It was a cool morning with a little bit of drizzly rain around. The breeze was chilly and that hot cheesesteak was oh, so good! 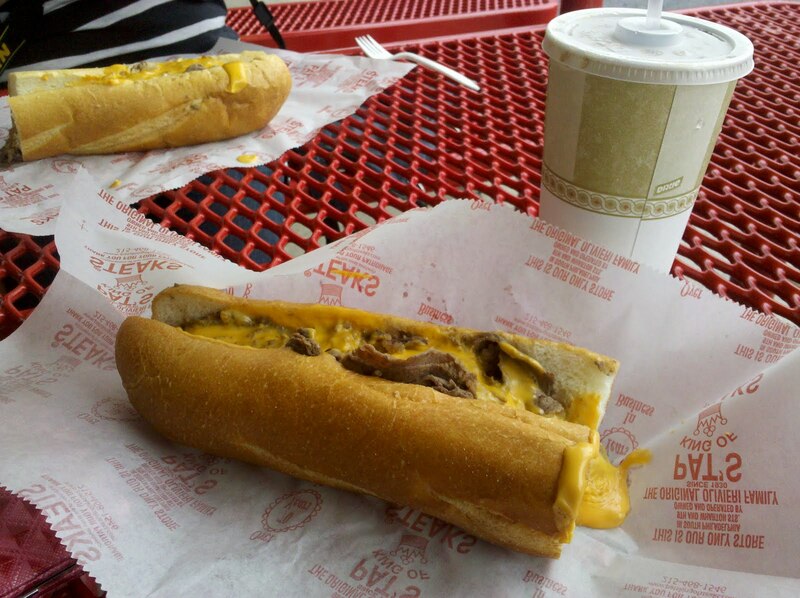 There are two very passionate camps about Philly cheesesteaks. Pat's and Geno's are directly across from one another if you want to make a scientific comparison, however, I am completely satisfied with our choice! Oh how I miss real Philly cheesesteaks. I'll take one with, please.